(CNN) - Texas Gov. Rick Perry, who recently attracted national attention for publicly mixing Christianity and politics, is putting some of his money where his mouth is - but not, critics say, very much. According to an analysis of his tax returns by the San Antonio Express-News, the Republican Perry has given half a percent of the $2.68 million he earned as governor to churches and religious organizations. By comparison, Americans averaged gifts of nearly 1.2 percent of their income to churches and religious groups from 2004 to 2008, according to Empty Tomb Inc., an Illinois-based research firm specializing in U.S. church-giving trends. In 2007 — a year in which Perry reported an income of more than $1 million — he gave $90 to his church, according to the Perry family's tax return. Twice since becoming governor, in 2000 and 2009, he reported no contributions to churches or religious organizations. 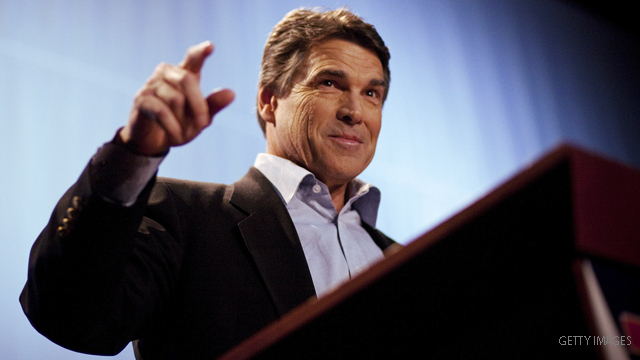 Speculation about whether Perry, the longest-serving governor in Texas history, will join the Republican presidential field is intensifying, as more and more Republicans encourage him to enter the fray. Earlier this month, Perry made national headlines by partnering with a conservative Christian group to host a forthcoming prayer event at Houston's Reliant Stadium. "America is in crisis, " the governor says on a website promoting the event. "We have been besieged by financial debt, terrorism, and a multitude of natural disasters." His track record could be a problem said Michael Lindsay, incoming president of Gordon College and author of “Faith in the Halls of Power,” about the growth of evangelical politics. What do you think? Will Perry's modest giving be an issue for his Christian supporters, especially if he runs for president? Should it be an issue? I will start with saying I'm no fan of Rick Perry, however, my guess is that 99.9% of the negative comments come from people who wouldn't have supported Perry anyway. As anyone who has gone to fundamentalist churches can tell you, much is given in cash in the collection plate, not a pledge, paid by check. My personal distrust of all politician, Republican, Democrat, or anything else is that they give to their own personal charity, themselves. Official giving to a church or charity isn't going to effect my vote. After Jesus was resurrected from the grave by the Father, He spoke of salvation twice to His disciples. 1.Jesus said: Mark 16:16 "He who believes and is baptized shall be saved; but he who does not believe will be condemned. The New Covenant terms for pardon were very clear. A. Faith in Jesus. B. Repentance (making the commitment to turn from sin and unbelief and turn toward God. And C. Be baptized in water. Jesus said it, "He who believes and is baptized shall be saved." WHAT JESUS DID NOT SAY ABOUT SALVATION AFTER HIS RESURRECTION. 1. He not did say be saved like the thief on the cross. 2. Jesus did not say be saved like Moses. 3. He did not say be saved like the woman who loved much. 4. Jesus did not say be saved like Enoch. 5. Jesus did not say be saved like Elijah. 6. He did not say be saved like the paralytic. 7. Jesus did not say be saved like Abraham. 8. He did not say to be saved like Noah. Men today are to be saved like the three thousand who were saved on the Day of Pentecost. (Acts 2:22-41,....40... "Be saved from this perverse generation." 41 The those who gladly received his word were baptized; and that day about three thousand souls were added to them.) The apostle Peter followed the instructions of Jesus. (Scripture from: NKJV) You are invited to follow my Christian blog. You can find by a google search, steve finnell a christian view. It is none of our business how he spends his money on charities. As a Christian, very little of what we give should be on paper as a tax break because we should give as God leads and not always in the form of a check to a church. We should give where there is a need whether it is a single mom is need of groceries or diapers to the elderly needing a ride to the grocery store to the homeless that lost everything to the teen that can't afford to go to camp. That is true giving. This is only more proof to me that Jesus was a liberal democrat not a conservative republican. Your never going to hear a republican being called a "bleeding heart" thats for sure plus they are the 1st to throw stones too! I am telling you people Jesus was a bleeding heart liberal democrate for what it worth to you! Jesus, the God of the Old Testament, wiped out all of mankind except Noah and his family. That does not sound like a bleeding heart libral. Do as I say, not as I do. It's the Republican motto. It informs their ideology. It's like Ayn Rand being a smoker and claiming there is no link between smoking and lung cancer, lecturing against Social Security, and lecturing against Medicare. Then she gets lung cancer and applies for Medical care under the name Ann O'Connor (her husdand was Frank O'Connor). She claimed an author couldn't afford what doctor's charged for cancer treatments. So? Wouldn't Ayn Rand say it was Ayn Rand's fault for not earning enough? In truth, she did earn enough to pay for the treatments. They just would have been a huge drain on her wealth. Perry's lack of charity is NOT an aberration given climate of fundamentalists who believe people who are poor and suffering deserve their lot in life AND that the poor are NOT worthy of charity, decent employment/wages or anything else. Religious fundamentalism in the US has become a religion of selfishness, gluttony and avarice where only their "righteous" deserve freedom and comfort. Criticized for not giving enough cash to a mythology. Only in America ... hahahahaha. This article means nothing. Perry simply didn't ask for the tax break. That shows generosity. A Republican not ask for a tax break? I don't think so. Gee, a greedy politician, what a shock! I respect peoples beliefs but most of these churches are ripe with scandal and greed, why waste money that could be put to better use elsewhere. Jenna – You act like you know. Name one church you were ever a member of that was 'rife with greed'? Every church I am familiar with is stricken with serious greed. I have a neighbor who lives in a 20,000 square foot house paid for by his church...oh yeah, he is their minister. Life of poverty my buttocks! I declare by the buttocks of E that the life of poverty is an invention of the Catholic Church to prevent Priests from making themselves rich and taking their wealth elsewhere. Jesus was not poor. That is a myth. He who created the whole universe was well able and capable as a carpenter /stone mason to support himself. He was GQ with a seemless coat. He looked like any Jew of his day. Blended in with the crowd and stood out only when he spoke. We're conservative (fundamentalist) Christians and don't report what we give – we render it unto the Lord! It's no one's business – including our pastor's – and especially not the government's. We throw away the little weekly envelopes and donate cash, not letting one hand know what the other is doing. The Church would be more pure if we lost our tax exemption. It's easier to speak the truth when you don't have to answer to Big Brother! Are you also the type of fundamentalist who doesn't want immigration reform? If so, does your idea of 'loving your neighbor' only apply to white people? Jennifer, no man, woman, or child on the internet ever cared about what you did with your money or your religion. randybuist/chris – don't change the subject. Jennifer's point is that Perry didn't report the giving as a tax break and this article makes him seem as if he's stingy for not reporting it. It's misleading. No, it makes him seem stingy because he gave so little. He is an idiot anyhow so who cares. The fact that he donated anything to them would cost him my vote. that kind of comment is as pathetic as being brainlessly brainwashed by the far right... just saying your kind of comments wouldn't get a vote by many good people either. Autiger, agreed! Why donate to an organization designed to fill human minds with fallacies? i was not surprised to see how little perry gave-the surprise came that he gave anything at all. this is the guy that threatened to commit treason by having texas secede from the union. this is the gov whose state is 47th in the nation in education. this is the state that executes more people than any other state. this is the state that leads the pack in misogynist laws. this is the gov who thought selling our roads and hiways to mexico might be a clever idea. this guy is sleazy smuck. woe to the people who would vote for this guy who will sell his soul to the highest bidder. Before Rick Perry was elected this last time, Texas Was doing great. Once he got elected he told us we are broke, and need to cut Education and get after those immigrants because they are taking our jobs. I know we are broke, but where are those jobs. Perry is a Moroon From Texas, I think he should move to Aridzona, they need a lying Firefighter that will tell them, There Ain't No Fierr Here Just Smoke! I would say that is a matter between him and the Good Lord. $90 contributions for the year isn't going to get my vote. These supposed conservative leaders that pray on the Evangelical vote are wolves in sheeps clothing and us Evangelical Christians take it hook, line & sinker. Washington politics is like a zombie virus....our good representatives go down there and never really come back. They just get chewed up, remolded and churned out by the system.